President Donald J. Trump has been in office for six months. And he has accomplished nothing. That's barely even hyperbole. While the Trump presidency has had a lot of impact on America and the world -- the withdrawal from the Paris climate accords, a freeze on regulation, and so on -- this impact has been almost entirely negative. There are some positives, of course. Trump nominated Neil Gorsuch to the Garland seat of the Supreme Court, for example. But that feat can only be truly credited to Mitch McConnell, who blocked Garland's nomination and got Gorsuch confirmed. Similarly, it's true that the stock market remains on the same bull run it's enjoyed for the past seven years and that the job market remains steady, but Trump hasn't appointed anyone to the Fed, gotten any of his priorities passed in a budget, or otherwise affected relevant policy in the past half-year. The Obama economy has continued: steady, incremental, and mildly disappointing. And that's pretty much it. The rest of the changes that Trump has had on our nation and the world have been changes of destruction. For a man who has prided himself on building things, thus far he has built nothing. Consider his legislative accomplishments (or lack thereof). 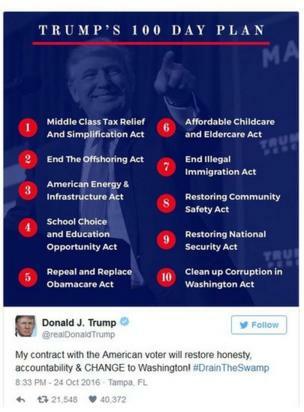 Trump promised he would introduce ten pieces of legislation within his first hundred days. After six months, he has not only failed to pass any of them, he still has not introduced any of them. This is remarkable. Every other modern president has thrown their weight behind a few pieces of policy in their early months, drawing on think tanks or a past congress for the bills. Obama, for example, pushed for the passage of the Lily Ledbetter Fair Pay Act, signing it within his first hundred days. Trump doesn't appear to have even attempted to get his own ideas into a bill, and the laws he promised to introduce... well, it seems like they never actually existed. They're wishful ideas, not laws. Other Republicans had plans, of course, and Trump may have been willing to just let them take the lead. But the optimistic plans of January, when Obamacare repeal would be done by "late February or early March," and tax reform would be finishing up right about now... well, things have gone rather differently. Obamacare repeal is inching along, badly wounded (though alive! ), and tax reform is a distant dream. President Trump is the first president in generations to have signed zero major bills into law in his first six months. Diplomatically, Trump has gone on a variety of foreign trips and engaged in some hullabaloo about trade. The trade noise has come to nothing, beyond some bold commitments to questionable plans, and the trips... well, they have not gone well. At the G20, he was isolated and unhappy. It was always clear that his attitude and policies would set him apart from the rest of the developed world, but it was surprising just how completely they united in the absence of American leadership. Nor was the Middle East trip much of a success; only days after Trump departed, the region broke out in a local crisis over Qatar's support for terrorist causes. The president was able to destroy deals like the TPP and the Paris accords, but building new ones? At least so far, it's beyond him. To add to this lack of accomplishments both foreign and domestic, the president is historically unpopular. No president at this point in his term has had such a low approval rating -- Trump started with an abnormally low level of approval, but immediately squandered any goodwill he might have gained by success with his first divisive actions and his refusal to reach out to one entire half of the country. For the past two months, he has plateaued at about 38%, but there is no reason to think that more Americans will be won over by repeated failure and constant revelations about collusion with a foreign power. We're six months deep. A lot of people have been hurt. A lot of opportunities have been lost. And a lot of damage has been done. No doubt about it, Trump can destroy. But he has built nothing.